Melt the chocolate chips over a double boiler or in the microwave. Whisk in the coffee and whiskey and then whisk in the egg yolks. Set chocolate mixture aside. In a large bowl, beat the heavy cream until soft peaks form. Gradually pour in the sugar and continue to beat until stiff peaks form. In a separate bowl, beat the egg whites with the pinch of salt until stiff peaks form. Fold the whipped cream into the egg whites, then fold that into the chocolate mixture. Cover and place in a refrigerator for 3 hours or overnight. In a separate bowl, beat the heavy cream until soft peaks form, then gradually add the powdered sugar and vanilla bean paste. Beat until stiff peaks form. 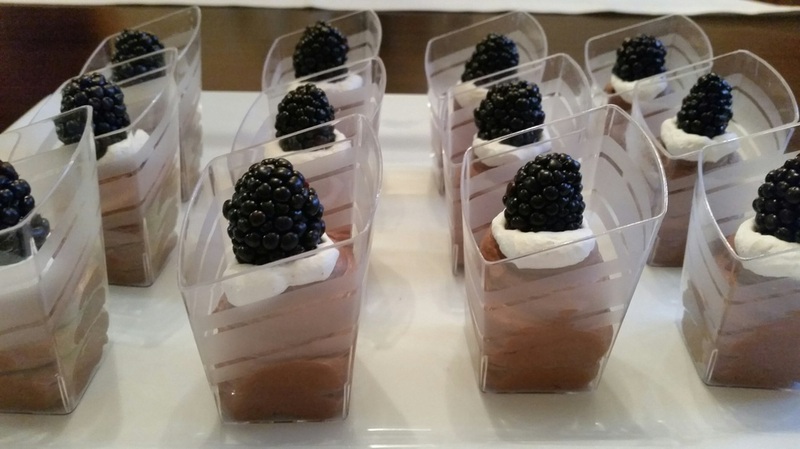 Place the chocolate mousse in a piping bag and pipe into a bowl or serving dish. Place the vanilla bean cream in a separate piping bag and pipe the cream atop the mousse. Garnish with fresh blackberries.